Occasionally teeth do not respond to conventional root therapy procedures and surgical intervention may sometimes be necessary to save the tooth. Jenny complained of pain from her last molar tooth. The front root had split in half while the back root was still intact. The fractured fragment was drifting away from the tooth and causing a localised infection. Surgical intervention was necessary to save the tooth as the loss of this tooth would have made her denture unstable. The front root was sectioned from the crown and removed (hemisection). The back root was left in place, the existing crown was re-contoured and a small filling was placed to seal the crown. Florence’s routine x-ray unexpectedly showed a very large but otherwise symptom free (no pain or swelling) area that looked like a large infection under her lower left canine. The area had been expanding in bone for some time. The area was too large to treat with normal root canal therapy and Florence was referred to an Oral Surgeon. 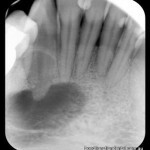 At the time of surgery the area was found to be a very aggressive cyst called a Karatocyst and not a dental infection. Unfortunately this type of cyst tends to recur and is very destructive. Florence has had two operations on the area. Eventually a more radical surgery was needed where five teeth had to be removed and the bone heavily scraped and cleaned. David’s lower canine, supporting a large span lower bridge, developed an infection in bone causing pain and swelling. The infection would not resolve despite good mechanical preparation and multiple placements of various medicaments. The loss of this tooth would result in the probable loss of his bridge. A minor surgical procedure called an apicectomy was performed where the end of the root is surgically exposed, the root tip sectioned and removed and the infection in the bone curetted. The root end was sealed with a special filling material (MTA) and the root canal was filled at the same time. Peter’s last tooth supporting his upper bridge developed a gum boil called a fistula. 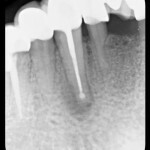 The tooth had been previously adequately root filled and had been symptom free for years. It was originally assumed that recontaminating the old root filling and causing a new infection was due to a crown. Despite re-doing the root therapy and multiple medicaments placed into the root canals the fistula did not go away. As the loss of this tooth meant loosing the bridge it was decided to surgically explore the area. 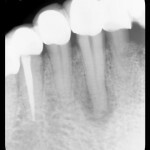 At surgery a fine vertical root fracture of the front root of the three rooted molar was evident. 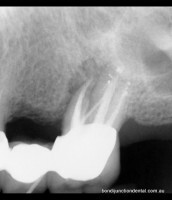 A hemisection was performed and the split front root was sectioned below the crown and removed. The area has healed and remains symptom free.